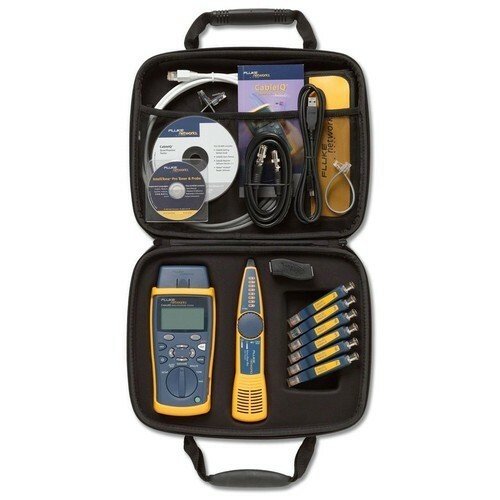 The Fluke Networks FTK2000 fiber optic cable test kit includes a SimpliFiber Pro optical power meter with a single mode light source to measure power and loss using dual-wavelength testing. SimpliFiber Pro simultaneously transmits 1310 and 1550nm wavelengths for verification of cabling in singlemode fiber networks. The power meter is also calibrated for 850 and 1300 nm wavelengths to measure multimode cabling when paired with a multimode light source (sold separately) as well as 1490 and 1625 nm wavelengths when paired with a compatible single mode light source (sold separately). A minimum and maximum function tracks power fluctuations and a reference value can be set to enable a display of fiber loss. The meter's internal memory stores up to 1,000 test results, and those results can be downloaded via the meter's USB interface to a computer for long-term records retention, or for analysis and generation of certification reports using the included Link Ware Software. Link Ware Cable Test Management software helps to analyze test results and create professional test reports. Packaging Details Good Export Quality Packaging should be done as per Customer Demand. We are a young enterprises that is engaged in IT Enclosure and Server Solutions that includes various Cabling Solution, as Amp Cabling Solution, Panduit Cabling Solution, Mole X Cabling Solution etc. Others Networking Rack Solution, Vpn Solution, Firewall Security Solution, VoIP Gateway Solution, Server Rack Solution, It Sever Storage Cooling Solution, Data Center Security Solution, Electronic Products, Aten Kvm Solution, Hp Networking Switch, Networking Cables, Networking Routers, Networking Copper, Networking Fiber, Computer Networking Solution, Data Storage Solutions,Data Centre Fiber Management, Voice & Data Fiber Solution, Network Operation Centre, Networking Equipment. These products are popular for their low maintenance costs, durable finish standards, easy installation and reliable operations. Our organization is proud to announce that we are a subsidiary of Rittal India Ltd. We are offering our clients with high quality product range that is manufactured by prestigious companies such as Dell, Systimax, Panduit and Aten. We are looking inquiries from Delhi, Mumbai, Chennai, Kolkata, Bangaluru, Ahmedabad, Hyderabad, Lucknow, Kanpur, Varanasi, Jaipur, Jodhpur, Ajmer, Bikaner, Kota, Udaipur, Bhilwara, Alwar, Agra, Meerut, Aligarh, Allahabad, Banaras, Mathura, Jhansi, Ghaziabad, Noida, Bareilly, Moradabad, Saharanpur, Uttar Pradesh, Punjab, Chandigarh, Jalandhar, Amritsar, Ludhiana, Bathinda, Pathankot, Patiala, Hoshiarpur, Himachal Pradesh, HP, UP, MP, Shimla, Dharamshala, Uttrakhand, Dehradun, Haridwar, Roorkee, Rudrapur, Rishikesh, Nainital, Udham Singh Nagar, Indore, Bhopal, Jabalpur, Gwalior, Ujjain, Sagar, Ratlam, Satna, Dewas, Gujrat, Surat, Vadodara, Rajkot, Bhavnagar, Jamnagar, Gandhinagar, Karnataka, Davanagere, Belgaum, Hubli, Chitradurga, Tamilnadu, Coimbatore, Madurai, Salem, Trichy, Tiruppur, Erode, Vellore, Kerela, Kochi, Thiruvananthapuram, Kozhikode, AP, Andhra Pradesh, Visakhapatnam, Vijayawada, Warangal, Guntur, Nellore, West Bengal, Asansol, Siliguri, Durgapur, Bardhaman, Bihar, Patna, Gaya, Bhagalpur, Muzaffarpur, Jharkhand, Jamshedpur, Dhanbad, Ranchi, Assam, Guwahati, Agartala, Shillong, Haryana, Karnal, Ambala, Panipat, Rohtak, Hisar, Faridabad, Gurgaon, Maharashtra, Pune, Nagpur, Thane, Nasik, Aurangabad, Rajasthan, Goa, Jammu, Srinagar, J&K, Chhattisgarh, Raipur, Bhilai, Bilaspur, Korba, Odisha, Bhubaneswar, Cuttack, Rourkela, Navi Mumbai, Virar, Kalyan, Bhiwandi, Puducherry and all over India.